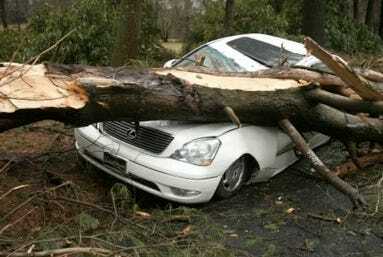 Greenwich cancelled school today so that the town could recover after an angry storm nearly destroyed the town Saturday night.In the Connecticut Post there’s a great slideshow of the massive damage down to the towns of Southern, CT.
It’s bad. Trees were (and are still) down everywhere. 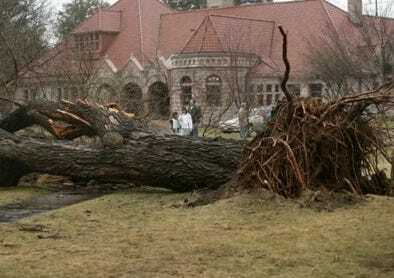 Authorities are saying it was worse than the Nor’easter of 1992. No word on how the Tudor and other hedge funds’ offices fared during the storm, but part of the roof of Greenwich’s Whole Foods caved in sometime before 6 PM on Saturday. People were in the store at the time, but luckily the store was quickly evacuated and no one was hurt. Other horror stories we’ve heard come from people who saw entire dumpsters floating down the street in Rowayton and trees crashing through houses and cars. Many drivers were trapped in on both sides by electrical wires, tree branches, and both. To get anywhere, they had to get out of their cars and physically move the branches and debris out of their way.The best story award goes to the owners of the three cars that floated away from a party Saturday night. We’re on the lookout for photos.